A Soulful Year is a mandala workbook for ending one year and welcoming another. Note: This is no longer available for sale, except for those who purchase the Holding Space Resources license. The transition from one year to the next is often a time for New Year’s resolutions and business or personal planning. With all of the resolve we can muster, we make good plans and set great goals. A few months later, we’re left with little more than guilt over the promises we made and never kept and the plans we neglected to follow through on. Those plans and resolutions fail because they are based on our internal pressure to improve ourselves, get more done, be a better person, etc.. They emerge out of our failures and feelings of unworthiness rather than out of our gifts, our best selves, and our hearts’ desires. What if you were offered a deeply soulful practice that could help you make the transition from one year to the next with grace, openness, and honesty? What if your planning emerged out of your strength and your soul’s desire rather than out of your weakness and lack of self-worth? 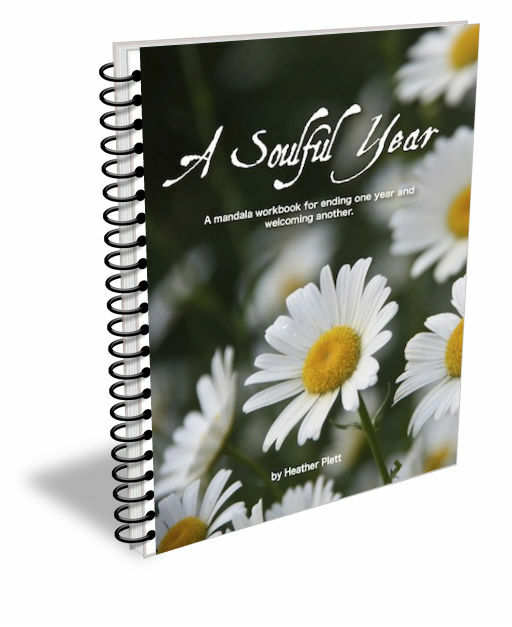 A Soulful Year (available in downloadable pdf) is a simple set of practices (based on my work in Mandala Discovery) that allows you to release the year that is ending and receive the year that is arriving. It’s an intuitive, heart-based process that guides you in the direction of your calling rather than making you feel guilty for all that you should be doing. Instead of setting yourself up for failure, you’ll be opening yourself to possibility. Instead of creating conditions for guilt and shame, you’ll be creating conditions for grace and growth. Instead of trying to fit your planning into unnatural square boxes, you’ll be thinking outside the box with mandalas and labyrinths. Instead of putting pressure on yourself to prove your worth, you’ll be stepping into that which gives you delight and courage. Like The Spiral Path before it, A Soulful Year uses the three stages of a labyrinth walk as its framework. First there is the release, when you walk into the labyrinth, where you let go of any of the baggage you were carrying this past year. Then you step into the centre of the labyrinth where you prepare yourself to receive whatever wisdom, strength, courage, etc. is already within you but has been hiding under your layers of fear and lack of worthiness. Finally you return from the centre, bringing with you whatever gifts you receive in order to share them with whomever you’re called to serve. A mandala practice that helps you reflect on, celebrate, grieve, and release the year that is ending. Whether it was an exceptionally good year, a terrifyingly bad year, or somewhere in between, you’ll have a chance to process whatever it was and then send it on its way. A mandala practice that helps you honour the cycle of the seasons and reflect on what you want to invite into each season. A mandala practice that helps you identify your longings and what you most want to receivein the coming year. This practice will also offer you a word for the coming year – something that will narrow the focus of your intentions. A mandala practice that helps you respond to those longings with clear intentions for how you want to live in the coming year. 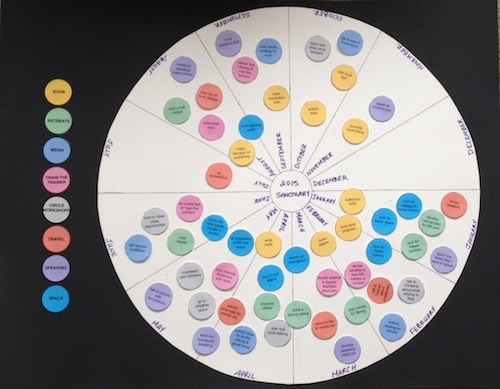 A mandala practice that helps you lay out an organic action plan for your year that emerges out of your longings and gifts and is flexible and adaptable to fit whatever needs to unfold. A monthly mandala practice for each of the months of the coming year that will help you create balance and intention in the month. want to live more intentionally with courage, strength, integrity, and trust. grow your work/practice in the world, whether that involves your own business, your non-profit work, your volunteer work, your relationships, etc. want to learn how to use mandala journaling as a practice for intention-setting and planning. want to find a practice that helps you silence the voices of resistance so that you can hear the voice of your heart. A few years ago, I invited a small circle of friends to join me at the centre of the labyrinth at midnight on New Year’s Eve. This workbook is the virtual (and expanded) equivalent of that experience. “Taking part in Heather’s online retreat A Soulful Year gave me time to pause and think about my intentions for the next phase of my life. Where am I going and how… The work encouraged a conscious commitment to the future and a release from the fears that bind us to our ‘old stories’. Note: A Soulful Year is no longer available for individual purchase. Only those who purchase a license for my Holding Space Resources will have access to it.